Yesterday I was unsure of what to do next. And today I had planned to practice free motion quilting. Well that’s all gone by the wayside. I started hand quilting my Which Way? quilt yesterday and I am so happy with the way it’s looking. I can hardly believe it’s my quilt it looks so… so… Oh I don’t know! I’m just happy with the way it’s turning out. Hence I plan to try to finish it today. Here’s a peek at what I’ve done so far. 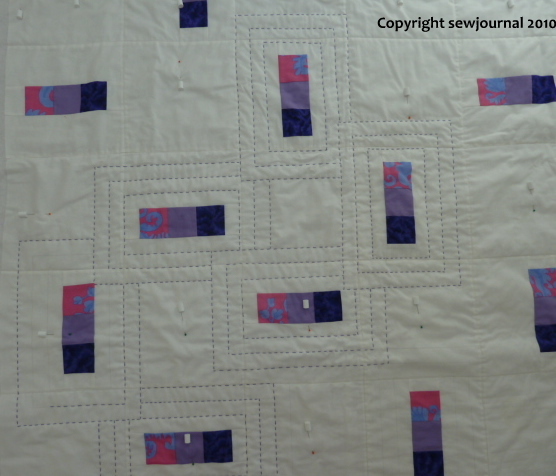 I have to thank Barb Cowan (professional quilter) for her generous and detailed feedback on the quilting pattern process. It was her faith in me that I could do it and her advice to ignore the actual blocks and just look at the quilt as a whole that inspired me to this pattern. Thanks Barb. 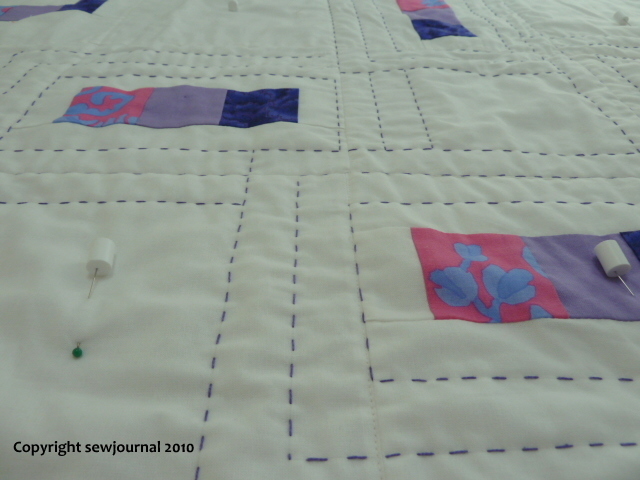 I really like that length stitch, it makes the quilting an equal feature to the piecing. It looks great! I am jealous….lol. What size is the quilt? I really like the way it is turning out. Great job. It looks fabulous! It gives me hope that I can attempt this someday in the far off future. Oooh yes! I really like the way you’ve made the rectangles interlock too! Very effective! Love the Sashiko and dark thread – it does mean you have to be really careful to stitch evenly, but it does really allow you to appreciate the craftsmanship. Really fresh and modern – Congrats on the lovely work- you really are staring to develop your own style. Oooo the design is wonderful!! The pattern is going to give this quilt so much punch!! This looks wonderful, I am not sure another pattern would have made it as “just right” as this one. Hard work but worth the results, well done. Love your quilt! Made me stop and look. It has a modern feel to it and I like that. Your quilting makes it stunning!